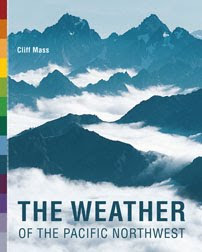 Although generally possessing a benign climate, Seattle does experience its own version of extreme weather that can takes lives and cause tens of millions of dollars of loss to the city. Some of these threats will get worse under global warming and some will lessen in their impacts. What are these weather threats and how can the city deal with them in the most effective way? So what are the extreme weather threats facing the city? (1) The most costly one, although relatively infrequent, is snow and the impacts on the city's roadways. For example, in 2008 a series of modest snow events, coupled with incompetent snow removal, crippled the city for several weeks. Several people died, dozens, were injured, and the economic impacts were certainly in the hundreds of millions of dollars. Snow events, and the associated cold weather, also have a heavy toll on the city's huge homeless population and several individuals die of hypothermia in every major cold/snow event. And a previous mayor (Nickels) was removed for poor snow removal. The snow/cold threat in the city should lessen in intensity during century since global warming will reduce its frequency. (2) The second most serious threat is heavy precipitation events. Ironically, for a fabled wet area, our infrastructure is not well equipped for short periods (hours to a day) of heavy rain. 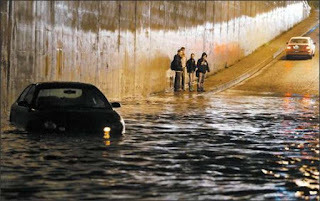 An example of such heavy rain occurred on December 14, 2006, leading to street flooding and the tragic death of a woman in her basement. Most of our heavy precipitation events are associated with strong atmospheric rivers, currents of warm and moisture extending out of the tropics. Heavy rain on our poorly drained streets leads to hydroplaning and increases in accidents and traffic congestion. 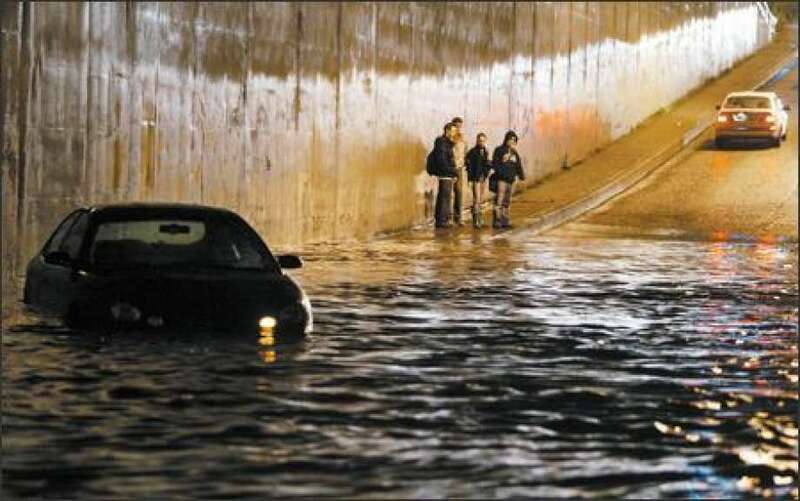 Perhaps even more serious are the water pollution implications of heavy precipitation over the city. 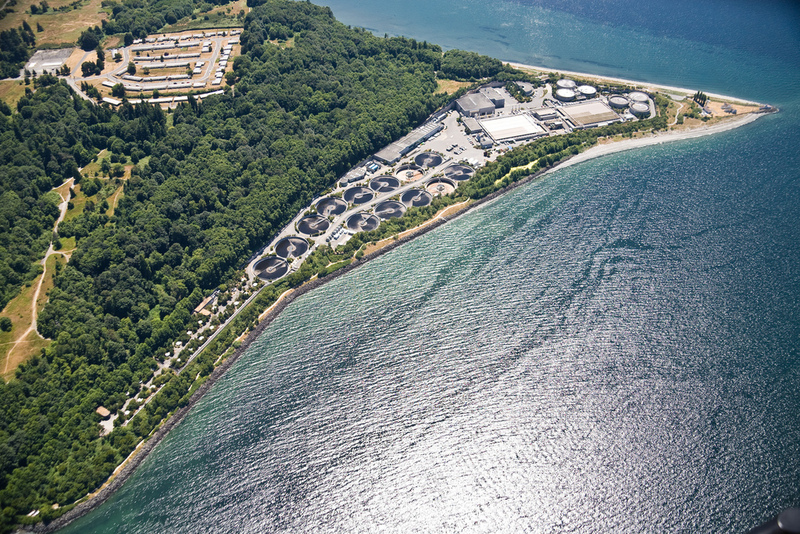 Time after time heavy precipitation overwhelms our water treatment facilities resulting in massive releases of sewage and toxic chemicals into the Sound and Lake Washington. Last year, the West Point sewage treatment plant was destroyed by a modest heavy precipitation event, not only seriously degrading the Sound, but costing over 50 million dollars of damage. Heavy rain has another major impact on the city: promoting landslides and slope failures, particularly over the steep slopes overlooking Puget Sound and Elliot Bay. Such slope failures not only close streets and damage/destroy homes, but often stop the Sounder (and other trains) coming in from the north. The threat of heavy precipitation events and associated flooding, sewage releases, landslides will probably increase during this century, since there is a wide range of studies (including some done by myself and my students) showing that global warming will increase heavy daily precipitation events by 20-30% by the end of the century. 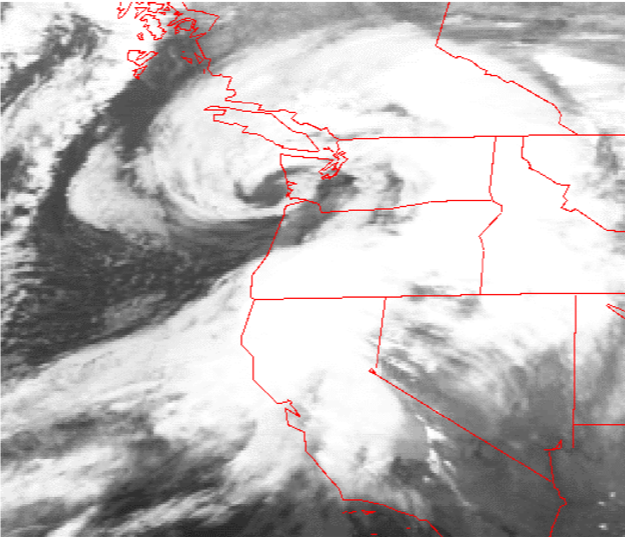 Each year the Puget Sound region is struck by strong winds associated with powerful Pacific cyclones passing to the north of our area. Each year, the city can expect at least a few storms with winds gusting to 40-50 mph, and every decade or so we get a major blow with winds gusting to 60-80 mph (e.g., the Inauguration Day Storm of 1993, the Chanukah Eve Storm of 2006). These winds can cause extensive damage to the electrical system as tall trees and branches fall on to powerlines. Unfortunately, such falling trees have frequently fallen on cars and individuals, causing loss of life and injury. Strong winds can also cause localized flooding in locations such as West Seattle, and the temporary termination of ferry service. 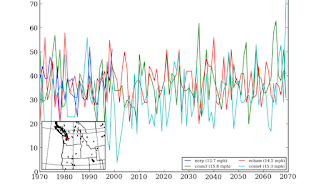 The threat of such strong winds does NOT appear to be increasing and should not increase under global warming, a conclusion based on detailed modeling studies done by the UW for Seattle City Light. Arctic warming actually reduces low-level temperature gradients reducing the "fuel" for these storms. The last environmental threat from extreme weather is less serious. 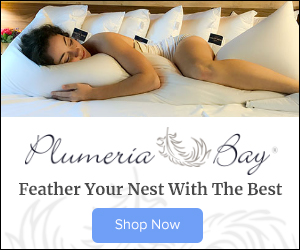 periods in the winter when high pressure and inversions are in place, a situation which increases the low-level concentrations of combustion products. summer periods when wildfire snow over the eastern slopes of the Cascades gets blown over the city (like last summer). Winter pollution levels are generally declining, as the use of wood burning stoves declined, good use of burn bans by local air quality agencies, and more homes using clean gas-burning fireplaces. 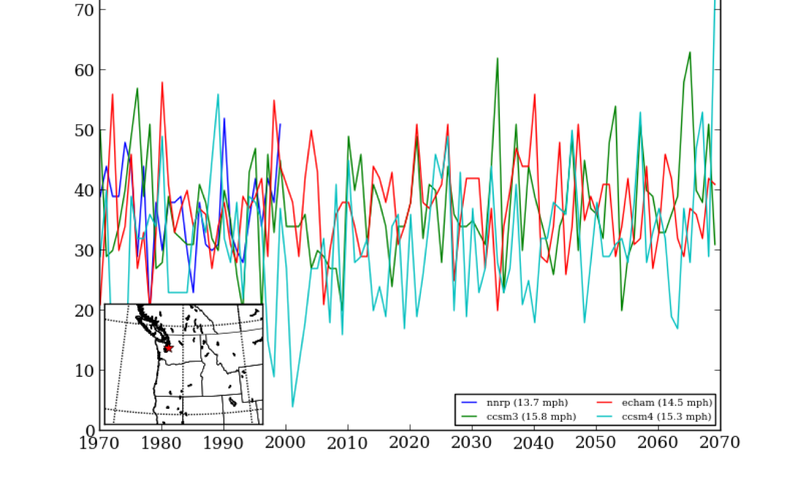 Long-term trends in smoke from eastern Washington fires is harder to predict since a major cause has been poor forest management, human fire initiation, and invasive flammable grasses. Will those issues be dealt with? Warmer and drier summers may accompany global warming, and that could contribute to fire increases as well. On the other hand, global warming should provide preferential heating east of the Cascades that will cause more of an onshore pressure gradient, resulting in more westerly winds (thus blowing the smoke away from Seattle). 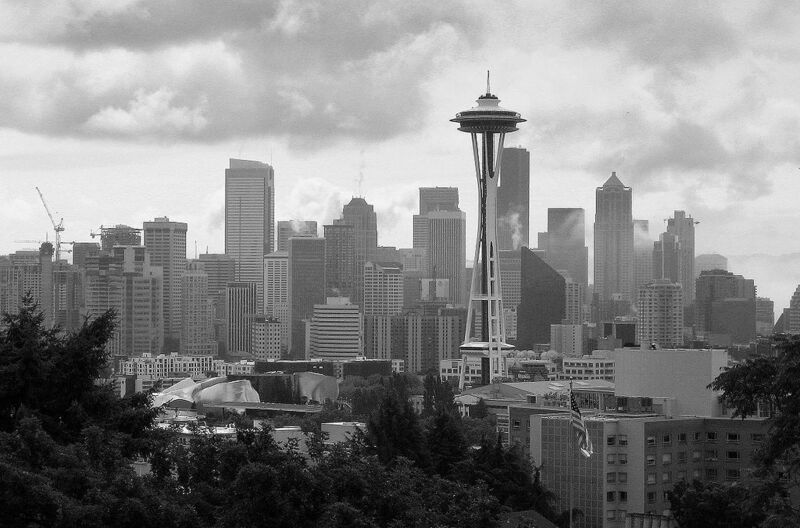 So how can Seattle deal with extreme weather threats? In the long term, making key infrastructure improvements (better waste water treatment facilities) and restricting development (e.g., no building on steep slope) is needed. But a huge amount is possible if city officials have the best possible guidance on extreme weather threats, which allows them to take steps to mitigate the risks. And this is one area that the city and the UW have worked closely on during the past decade, and where substantial progress has been made. Smart management of extreme weather allows protection of vulnerable populations and in preparing the city for active and threatening weather. Let me give you some examples of some operational systems that the city has in place. Sponsored by Seattle City Light, this system (and website) continuously monitors regional wind observations and several high-resolution weather models, telling City Light personnel when strong winds will occur or are occurring. This allows City Light to bring in personnel and supplies before strong winds hit, thus allowing more rapid deployment and power restoration. Notice how City Light gets the power on before PSE? This is one reason why. After the tragic death of a women in the Madison Valley in 2006, Seattle Public Utilities invested in the development of RainWatch, which constantly monitors the local weather radar and local precipitation gauges to determine whether heavy rain is occurring, or when certain precipitation thresholds are met. It allows monitors high-resolution weather models for heavy precipitation events and warns SPU personnel when dangerous situations are imminent or occurring. With this knowledge, SPU personnel can make strategic plans for water storage and the placement of personnel to deal with precipitation "hotspots." SnowWatch is a highly sophisticated snow monitoring and prediction tool. It monitors short and long-term weather prediction models for a snow threat, and gathers surface air and road-surface temperatures. It checks the snow level aloft in real time. Supported by Seattle DOT and Seattle Emergency Management, SnowWatch plays an important role in SDOT's management of Seattle's streets, including the pretreatment of streets with deicers, salt, and sand BEFORE snow strikes. 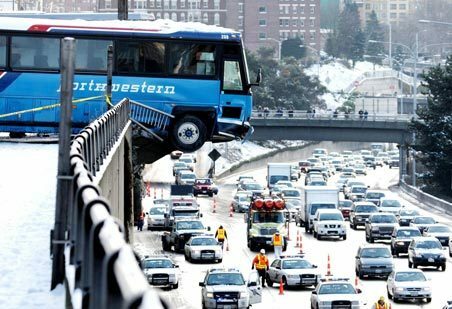 Seattle mayors like SnowWatch. These three applications were created by Jeff Baars, a research meteorologist here in the UW Department of Atmospheric Sciences, and I have been involved as well. Lately, we have been playing with a new concept, combining these extreme weather monitoring packages into one, with the addition of other guidance (e.g., landslide prediction, air quality monitoring, sea level monitoring). Our first cut is below. Eventually, the monitoring could be combined into a one-stop monitoring page that would allow Seattle's emergency managers to review all threats with one glance. Good monitoring and forecasting information is of substantial value in dealing with contemporary extreme weather and is the first line of defense for dealing with potentially escalating extremes in the future. It’s too bad Wind Watch and Snow Watch are so Seattle-centric - it seems like there’d be great utility for tools which covered the entire urbanized Puget Sound corridor. BTW the Seattle City Light versus Puget Sound Energy comparison seems rather specious. No matter how sophisticated the available tools, the physical area each is responsible for would dictate the PSE has the significantly more difficult task. Nice downpour of hail in Maple Leaf a bit after 4:00 this afternoon, followed by light snow. Now it is a "wintry mix" with the temp on my front porch at 32 degrees. Although not technically a weather issue, the Cascadia Subduction Zone is an event of which the entire NW region is wholly unprepared for at this point in time. Although recent estimates put Seattle mostly out of harm's way in terms of the expected tsunami, the earthquake alone could be devastating. At least Seattle has enacted building code restrictions on new construction, something even Portland has been negligent in discussing. Going to Snow Around Puget Sound Very Soon!